As Saturday morning dawned clear and crisp three very excited women left their respective sleeping families and took to the highways and byways on a very important mission that was three-fold. If you have never experienced the joy that is Sam Moon, well, my heart hurts for you. Imagine a warehouse stuffed floor to ceiling with every possible pleasantly priced (read: cheap) accessory known to man. Or woman actually. When Heather's car tuned into the parking lot, it was like the mother ship had called us home. Needless to say we were a giddy trio. 2.5 hours later (yes, you read that right), after scanning most aisles at least once, others at least three times just to make sure we didn't miss the perfect necklace or bracelet, hemming and hawing over colors and styles and cackling like socially starved maniacs, we bid Sam Moon adieu. Not only did I go crazy for cheap costume jewelry (orange, turquoise and pearls were the hot items of the day), but I also found a good belt for jeans, another skinny belt for cardigans (at least that's the plan in my head), a cutesy monogrammed "H" insulated travel mug, a cutesy monogrammed "H" hard clutch wallet and a cutesy hot pink & lime green polka dot lunch kit for Annelise (she was beside herself with glee). It was a good day. I might still be a little high from the shopping adrenaline and laughter. We did not let the rain deter us (even though we looked a tad disheveled after running through it) from the next phase of the day, the book signing at Barnes & Noble. We had a little time to kill after purchasing our books (I only purchased Francine's new book since I've already been reading about insecurity) , so we settled in at Starbucks for a little chat and yummy sustenance. We soon made our way upstairs to wait for the signing to begin. We were in group 3, but the wait wasn't too bad at all since each grouping was small. 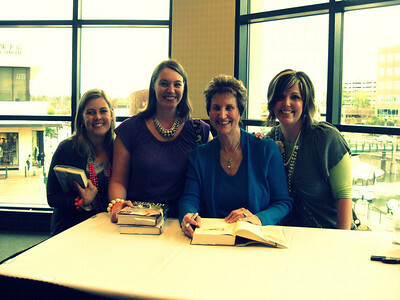 We could hardly stand it though because we were soooo excited to meet Beth and Francine! Heather took a last minute potty break while Kim and I kept our spots in line. Imagine our surprise a few minutes later when we glance over and see Heather walking back with Beth herself, chatting it up like they were old friends!! It was hilarious! Our jaws dropped to the floor and we waved at them like gleeful idiots I'm sure. First we met Francine Rivers and had her sign our books. She was so kind to let us pose for a picture with her as well. She writes historical Christian fiction and I highly recommend Redeeming Love and the Mark of the Lion trilogy. Notice all of our Sam Moon bling? Don't you LOVE Heather's splash of orange and Kim's quirky silver pearls? 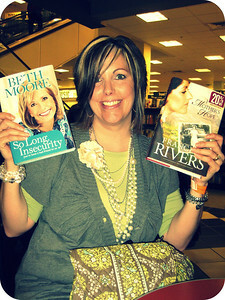 Then, gulp, it was our turn to meet Beth Moore!! Let me just say not only has she been blessed with numerous talents which she uses in women's ministry and to glorify God, she is the cutest little thing ever. Ever. Since we have done several of her bible studies over the years (highly, highly recommend you do them too), meeting her in person was such a treat! I think we may have scared her just a bit with our over the top enthusiasm and random comments. We felt the need to tell her we had gone to Sam Moon--she said she could tell, Heather let her wear her orange necklace for one of the pics, we told her about our love for flamingos and pink boas, Kim showed Beth her scripture journal--which Beth autographed, I mainly grinned like a loon and giggled. We waited and went through the line twice so we could take more pics with her. She probably thought we were out on a day pass, but was sweet and well mannered enough not to say so. I almost didn't post the pics that included me because I was none too pleased with the results, but decided to girl up and get over it. The irony of Beth signing her new book So Long Insecurity and me nitpicking myself to pieces was not lost on me, nope, not at all. I don't have (yet) a photo of Beth and Kim or one of our group shot. I'll add them when Heather and/or Kim upload their pics (hint, hint, nudge, nudge). Next up was a little more shopping (um, Ann Taylor LOFT, why are you so proud of your stuff right now? C'mon, mark some stuff down and make a girl's day! ), which led me to a life changing moment. I don't know what came over me, but after reading that PW wears Banana Republic skinny jeans and says they are skinny jeans for real (not skinny) bodies, I gave them a whirl. She was right. Of course. Thanks to a 30% coupon I am now a convert to the skinny jean. My mind is still reconciling itself to this fact, but I will say they are super comfortable and Heather and Kim gave them the four thumbs up, girlfriend squeal of approval, so I went with it. 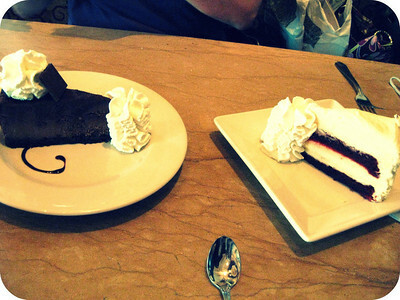 Godiva Chocolate Cheesecake and Red Velvet Cheesecake were, of course, to die for and the perfect ending to the perfect day. I hope my skinny jeans will still fit. Stay tuned...I'll be back later this week with a thinking outside the fashion box type post. How exciting! I would've been grinning like a loon too. I love how Beth hugs! And you look great! And I love the new accessories! Sam and Moon, come to Maryland please! 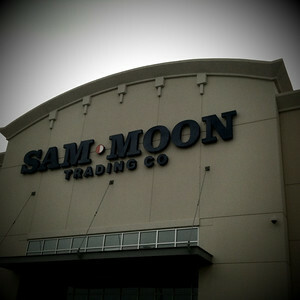 Where is this Sam Moon place??? Actually, don't tell me, the last thing I need is to buy a million beautiful (cheap) accessories! I love the way you write, you make me giggle with your one day pass talk etc. That cheesecake looks so incredible. Makes me want to give up the diet and speed over to CF to ge my favorite boston cream pie cheesecake. You should try it. Or maybe not. It may ruin your life forever. What a fun day! And you must show off the skinny jeans. Picture please! Sincerely Anna: Yes she does! She is soooo personable and makes you feel--instantly--that she cares about you, know you, etc. Nicole: I might post a pic--if they still fit after all the cheesecake! Ha! I don't know if I'd wear them all the time, but with a looser, flow-y type top or sweater skinny jeans look more pulled together or something. Maybe someday I'll get brave enough to buy boots and tuck them in--oh my!! Was at Sam Moon, just today. Sadly (or not), a new one is less than 10 minutes from my front door. I have never heard of Sam Moon before, so I'm clueless of its joys. You girls look adorable in these photos, what a fun outing! Rochelle: Living THAT close to a Sam Moon could be dangerous!! Ours is an hour-ish drive so we don't get there too often--that's why we kind of go crazy when we do. HA!